Welcome to my little corner of the world. My nest. Or would that be lair? Okay, so it's supposed to be the "family" room but everybody in my family knows it's my room. Yes, my husband designed it to be his room with a big television, comfy oversize leather furniture and hunting decor. But he did such a bang up job of making it cozy that I pretty much moved in and took over. Come in, let me show you around. The actual center of the universe, as far as I'm concerned. Can you tell where I sit? The cushions are so worn on that end of the couch that they're permanently squished. The fuzzy blanket gives the dog and I something to fight over. I like it over my feet and she thinks it's hers. In all fairness, she's little and the leather IS cold when you first sit on it. I can't imagine how it must feel on her belly when she lays beside me, so I usually let her have it. Gosh, I could have at least picked up my oatmeal bowl, but nope, there it is. Right there for all to see. Yes, I drag food here and eat in front of the TV. At least this was healthy food - the overnight oatmeal/yogurt with chopped up mango in it. I love that stuff and it's not just for breakfast! You can also see my phone, one of my hundred pair of reading glasses, the TV remote and a few random beads. Doggie's collar is on the other side of the lamp because my son always takes it off her so she can run naked. He insists she likes being naked. The shelf underneath has more beads I dug out for a project. I've wanted to do a fringe bracelet with an under-the-sea theme and I've been collecting bits for it. I have some Czech glass fish and shells, some real seashells, stick coral, some starfish charms and a random assortment of seed beads there. I'll get around to that one of these days. Or I'll sort it all back into the containers of beads I have by color and they'll surface again somewhere down the line for some other project. Nothing stays static for long here - ideas come and go faster than I can keep up. The little tote on the floor is supposed to hold my essentials like my scissors and assorted pliers. Right now, however, it also holds a nail file, hand lotion, Epoxy clay and duct tape. And this is me. And that's the nickle tour. Thanks for coming and be sure to tip your guide. 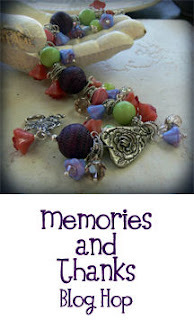 Lori Anderson is hosting a blog hop in honor of a friend of hers, Marianna, who passed away unexpectedly. The theme for her hop is "Memories and Thanks" and she wanted to take it further than one person. 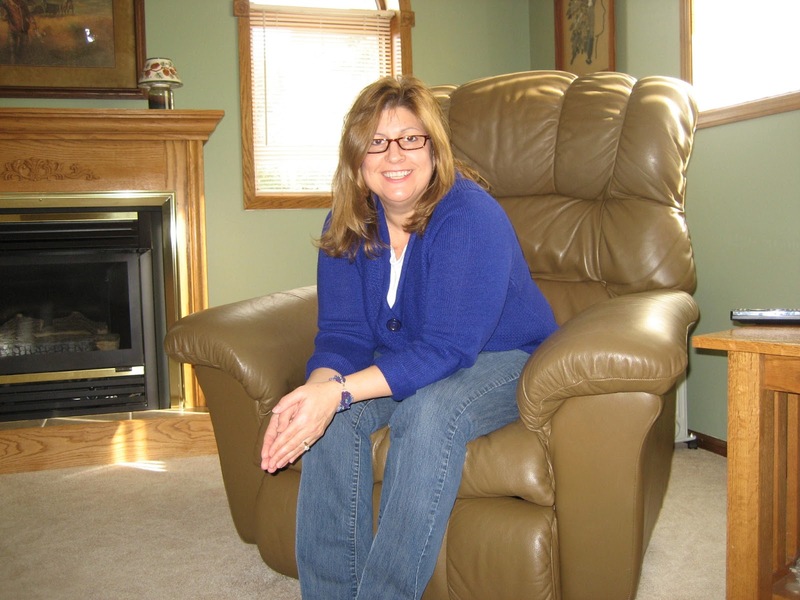 She wanted each of us to blog about someone in our lives who means or meant a lot to us. Marianna's favorite color was red and when I heard that, I knew right away who my special person would be: my Gramma Blanche. 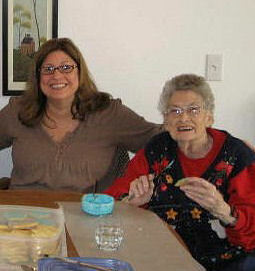 This is Gramma and I at Christmas last year. 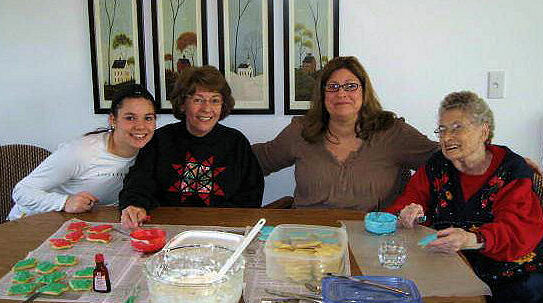 We were decorating cookies and having such a good time. As much as I hate to share pictures of myself (or look at them, for that matter), here's another from that day that includes my mom and my daughter, too. Four generations of trouble makers and cookie decorators. I have the best memories of my grandmother when I was growing up. I used to spend nearly every Saturday night with her and my Papa, watching the Carol Burnett show all snuggled in clean jammies (they got cable!). We'd get up the next morning and put a roast in the oven before we went to Sunday School and have a big Sunday dinner after. She and my grandfather apparently had the patience of saints, too - they took me on a road trip from Nebraska to San Diego, California when I was around six or seven years old. We stopped to see the sights on the way and she bought me charms to put on a charm bracelet. We went to Disneyland and Mexico and I had the best time! Gramma had a ceramic shop when I was growing up - the Nic Nac Shelf Ceramic Shop. I remember working in the shop with her up until the time I was in high school, although I'm not sure how much help I was in the earlier years. She taught me all about slip and molds and stains and glazes. She always liked to make things whether it was ceramics, sewing, crochet or cross stitch. I really love the sinuous curves of the soutache. This piece was the first piece I attempted using Soutache, and let me tell you, it was a lot harder than I thought it would be! I almost threw in the towel and chalked it up to one of those things I'm just not cut out to do (like washing windows). I did try again, though and with the lessons I learned (the hard way) the first time, my second piece was better. And just in case you're thinking of trying your hand at it, I will share. 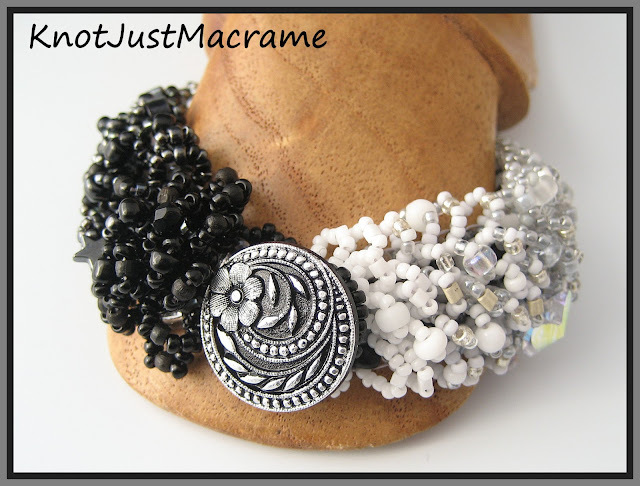 The first thing that struck me was just how tiny this stuff is (and that's from a gal who does micro macrame, people!). It's about 1/8" wide, give or take, and if that's not bad enough, you actually turn it on its side when you use it, so you're standing it up on the skinny edge. The skinny edge of 1/8". From what I've gathered, there are two basic kinds of Soutache - imported and domestic. Of course, that's all relative to where you're located, so sometimes you'll find imported European domestic Soutache or other confusing bits. Suffice it to say, some is made in USA, some in Europe. The American stuff is just a bit smaller than its European cousin. The European stuff is just a bit beefier (if that even applies to anything in the 1/8" category) and tends to fray a bit more easily. Quite a bit more easily, in fact. You might want to get a bit of Fray Check on those ends (or a dab of glue or nail polish - whatever is handy). I learned to run my cord through my hair straightener (or iron it on a low setting, maybe? If you own an iron...) before I start so there are no little bitty kinks in it. Those don't go away and are magnified in your work. I found working on a backing instead of "freestyle" is much easier for me (there's a tutorial on that here) and I also decided it's much easier to stitch together the Soutache before adding it to the design. On my first piece, I added each piece (color) of Soutache separately (I'd go as far as I could with one color, then add another, etc. until I got to a turn - if that makes any sense?). Anyway, I tried stitching the colors together before actually adding it to the cab and found that much easier. Do you see how there's a "ditch" in the cord right down the middle? Line up the "ditches" (that will even out any little differences in size if you're using a mixture of domestic and imported Soutache) and run a quick stitch through them. This makes it much easier to handle because you not only have one piece to maneuver around those curves instead of three, but it is also three times as wide - three pieces on edge side by side instead of one - and much more stable. Let's see - what else? Oh, you can see in that first piece that the sides don't quite meet at the bottom? And so one side is slightly shorter than the other? Where your cords meet (like at the bottom of that piece) stitch the cords together. That's right - go through all the cords and make a couple of stitches. Then when you separate them again to go their own merry way around the curves, they'll STAY where you had them together. Trust me - you'll be glad you did. If you'd like to see how my second piece turned out, check out the post about it here. The theme for this week in our Year of Jewelry is "Grace". My interpretation of grace involves flowing lines and graceful curves and I tried to emulate that in this piece using a combination of bead embroidery and Soutache to surround a cameo. This is my second attempt at using Soutache. I am definitely still in the learning stages, but I felt more confident with this piece than my first one. If you are not familiar with Soutache, it's a very small woven trim (about 1/8" wide) used to adorn draperies and clothing - particularly military uniforms. For this piece, I attached my cameo to a piece of backing and added a row of seed beads using bead embroidery. I curved three layers of Soutache around that and added some beads at the corners and pulled the Soutache back around them. I like the curves, but I'm not thrilled that my thread shows in the beads. Note to self: work on that. In order to give the piece some length, I added a Swarovski teardrop shape at either end and more Soutache around those. I thought it still needed a little something, so I went back and added another row of seed beads along the long curves - this time on their sides along the Soutache. I added a piece of suede to the back to cover all my stitching and the ends of the Soutache and then attached it to a barrette. I'm getting the feel for Soutache. It wants to be graceful and flowing - I just have to learn how to get it to go where I want it to without interrupting it's flow!